Sr. Joan O’Connor, CSJ passed peacefully into eternal life last week. Sr. Joan was the assistant principal at St. Paul in 1977-1978. She returned in 1989 when she accepted the position of principal several weeks after it was announced that the school would be closing and then officially re-opened. She remained principal until 1998 stabilizing the school with the assistance of many committed faculty, parents, students and alumni. 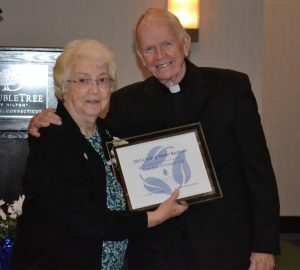 Sr. Joan was inducted into the St. Paul Circle of Honor in 2015 and was extremely humbled by this honor! Services will be held this Friday, January 25, 2019 at the Motherhouse of the Sisters of St. Joseph of Chambery, West Harford with a wake at 9:30 am, prayer service at 10:15 am and Mass of Christian Burial at 11:00 am. Please keep Sr. Joan in your thoughts and prayers of gratitude. May she rest in peace!